The waters around Boston Harbor came alive this week. We all knew it was just a matter of time with all the large pods of bait being sighted from Egg Rock through all of Broad Sound. The inner and outer harbor was loaded with herring, pogies, mackerel, squid and butterfish. The bass were on the rampage all week with blitz activity along Revere & Winthrop beaches with loads of activity in the main channel, the backside of Spectacle Island, and all around the airport Saturday morning. At least 50 boats were in the main harbor channel, all catching bass and blues and good sized fish to boot. I was also told that Friday morning was just as crazy. The late morning action moved closer to Long Island, and at one point it looked like you could walk from Spectacle to Long Island on Bass. Your best bet this week is to watch for the birds moving the bait and cast to the edges of the schools. This seems to be where the bigger fish are during all the top water chaos. The hot lure of the week for these top water blitzes was definitely the Shad. Pearl & Mackerel were landing bass one right after the other. Another lure to try when you see the top water blitz is the casting spoons. Anglers were landing keepers with these tiny, shiny plugs. The Niner rig, an old time favorite around Boston harbor, continued to produce this week for Bingo’s, Brian MacDonnald & crew last Sunday. 30 hookups and 5 keeper Bass were a direct result of trolling the umbrella rig slowly. Ken Streeter Sr. & Junior also seem to be on a real hot streak lately, still grabbing macks out at Graves, resulting in gear busting sized fish. 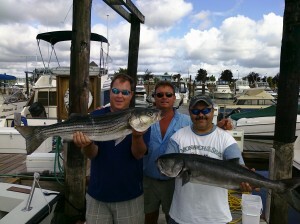 Using fresh pogies also turned in some spectacular fishing for a number of anglers. 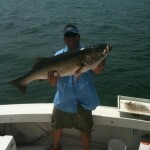 Adam Sullivan of Winthrop, fished the outgoing tide using fresh pogy chunks and he and his crew landed 30 plus fish. John Miller caught a “meaty” 43 inch bass, trolling a pogy chunk north of Graves. The numbers and sizes of the Bass this week are back to weeks of previous. More reports of bigger fish versus the schoolies. Another sea worthy catch this week goes out to George Bossell, Captain of the Micky Finn. He hooked up with a 7’ blue shark right before I started this report. He and his son Carl were Tuna fishing at the Southwest Corner. It’s not just the water that is heating up, the fishing is hot-hot-hot. We can’t say enough about the Boston Harbor flounder fishing, so we decided to report on this fish first. They seem to be the fall-back fish of early season. Anglers targeting, but not catching bass, seem to always round out their fishing trips with some island flounder fishing to ensure their coolers don’t come back empty. Deer Island flats, Hospital Shoals, Green Island and Governor’s flats are still producing large numbers of derby sized fish. Your chances of catching these fun-tugging fish however, are lessening each week. Soon they will be retreating to deeper water and proving more of a landing challenge to anglers. Drifting sea-worms on the double-hook flounder rig with a 2-3 oz bank sinker is resulting in many fish over 16 inches. Now let’s talk about the bait. Among reports of no more mackerel, reports of large numbers invading the outer islands came in this week. Another spot of “spotty” mackerel was Minots Ledge. Get out there early morning though before you’re dogged by Dogfish. Once they show up – your game is over. Team GoPogy snagged two large mackerel over at Deer Island flats while flounder fishing. The Esca lure rigged above the glo-worm flounder hooks secured these, proving the mackerel haven’t pushed out completely yet. Pogies are definitely here. The snagging has begun on the Winthrop side of Boston Harbor. No large numbers yet, but if you spend an hour dedicated to catching this bait, you can get just enough to land a few nice-sized bass. Eels seem to be the night-time choice of Kayakers. Fishing them live as well as dead are landing keeper fish. Bridge fishing turned out a major success story this week for Winthrop. 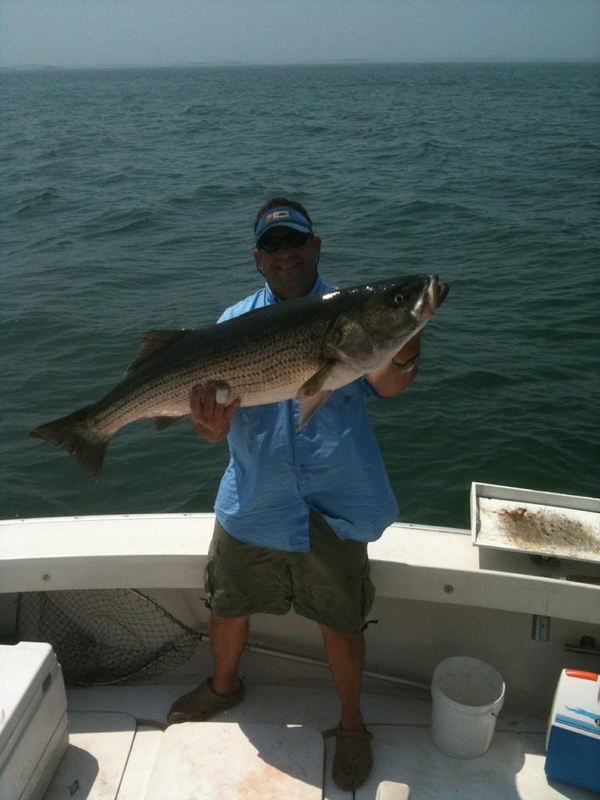 Bledar Naco landed a 42 inch striped-bass beauty. Bait of choice…..clams. Way to go Bledar! Reports of multiple keepers came in this week from Danvers. Bass were enticed by the Green Mackerel & Oreo Cookie Shad Umbrella rigs. A huge Bass blitz was called in at the entrance of the North East Channel mid-week, providing excitement for over 20 boats. Even GoPogy got in on the action this week. We married up the Esca light with the Shankas eel over at Deer Island rip and the outcome was 4 keepers, all mid-30 range…a blissful union indeed. The fish are getting bigger and the fishing is getting even better.